Explore Aranias' past on Silatar. Spinner's Cottage — Take part in Aranias' story. "There's a nice, warm fire burning there, and I'll set the scene." The Veiled Heritants plan to harm the Wilderking. If I enter Aranias' past through Maruin's story, I can change her future. Find the pieces of Aranias' story. Change clothes and talk to Aranias in the manor garden. Talk to Andur in the field. "You certainly took your time about things. Not your fault, I understand, not your fault. We may yet get this right!" What are you talking about? Where is Aranias? You must also enter the story in order to help her." "Aranias wants to see the Wilderking. I'm his gatekeeper. To see him, you ask me nicely and then I tell you a story. A story that you take part in." So she's inside the story you're telling? "Yes. The story is one from her own past, but she's convinced that she's living through these events for the first time. You'll play the part of the close friend she never had. Someone she can trust, who can change the person Aranias becomes." All right, then put me into the story. May I please join Aranias in the story? "Of course! Now, sit down by the fireplace. Imagine there's a nice, warm fire burning there, and I'll set the scene." "Have a seat by the fire and let me know when you're ready to hear the story. Remember, ask nicely." "Imagine the flames are the waves of a vast ocean." "Cold waves on a clear blue ocean off the coast of Summerset." "Now picture an island. Trees around the island shimmer in the sunlight; each gently cresting ocean wave sparkles. Many stones, roots, and flowers on the island were shaped by magicka. 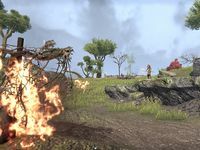 Only two living Altmer possess such power." 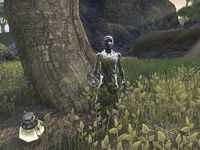 "One of those two Altmer stands outside the manor on this island. Her island. Go to her. Become her friend." 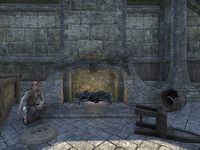 You awaken next to a fire in a house on Silatar, a small island in the Summerset Archipelago. Spinner Maruin will then announce it: "The island of Silatar." "I'm so glad you could come! My parents will be back tonight, and I was afraid I'd have to face them alone again." "That's why I asked you to come early. I'm not sure what will happen either. Before they get back, I want to be carefree. We can visit some of our favorite places together." "Why wouldn't I? We practically grew up together. You're the only one I can trust these days." You don't remember anything about Bramblebreach? It's not important right now. Why'd your parents leave you here? Your mother and father are gone? "They were afraid, like everyone else. After I raised up the land under the sea and smashed that ship … even though nobody got hurt they said my magic was too dangerous. You're the only one who isn't afraid of me. You're … not afraid, right?" "You don't know what that means to me. Now, what will we do first? I know. Let's race to the lighthouse, like we did when we were little. Bet you still can't catch me!" "Oops! Are my vines getting in your way?" "Not bad. You're pretty fast." Did you just bind up my legs with vines? "Maybe. You know I've always had a special connection to the land. Sometimes things happen, and I don't even think about it. It just happens." "I'm sorry. It just happened. Wait. Something's wrong. Can you feel that? The land's in pain, burning hot. Look! The farm's burning!" "Over the rise. Wait. Too many footsteps, and it's too early for my parents' return. Boots. Boots …. There are invaders on Silatar. We have to stop them!" "What have they done to my farm? Why would they do this? Animals!" "Does it matter? I'm tired of this! Everyone wants to hurt me or use me, and it stops now! Where were you when my parents 'tested' me? Where were you when I needed you most? You left me. Why are you even here? DO you want something from me too?" "I'm … I'm sorry. After my parents left, I felt so alone. I couldn't find you. People kept coming. They'd attack, hound me, want me to show them what I can do. Like I was a circus animal, or some kind of pet! I shouldn't take it out on you." I didn't realize how upset you were. "No, it's not your fault. Thanks to you, these bastards didn't get very far. They could have destroyed everything! It's getting late. We need to clean up before my parents return. Meet me at the manor later. "In her tale, Aranias was volatile and she swung between anger, shame, and hope. Feared by her own parents because of her abilities, she faced the bandits alone. This made her bitter and hardened against others. Vulnerable to outside influences." "You will soon see it for yourself. But first, you should view another scene from Aranias' past. She was a bit younger, and excited about her newly-found skills. Are you ready? She doesn't remember anything about Bramblebreach. "Of course not. For her, it hasn't happened yet. Remember, I put you into her past to help her when she's at her most vulnerable. She lashed out at you just now because she can't fight against her parents. She trusts you. That's what's important." I'm ready to see more of her past. Indrathel: "Why are your clothes all wet?" Aranias: "Mother! What do you think of this tree? How about the island you're standing on?" Indrathel: "The ground is soaked. I will need new shoes now." Indrathel: "What? You made the ground soggy?" Aranias: "The island. I made this little island!" Lorimil: "What? Ara, what do you mean you made it?" Aranias: "These trees, those rocks, none of this was here yesterday. The ground is wet because I used my magic to pull it up from under the water." Indrathel: "Oh, Ara. What have you done?" "Gifted with a rare and powerful ability, Aranias tried in vain to win her parents' affection." "So much 'happened next,' but I especially draw your attention to two particular events. One scene is atop the lighthouse. The other, in the manor's great hall. They will help you understand more about our troubled Altmer, I hope." Is that all I need to do? Understand her? "No. The greatest challenge comes next, and Aranias needs you. Her parents returned after the attack on the farm, and brought with them the people they considered their daughter's only hope. The Veiled Heritance. She should not face this alone." "Getting changed at the manor. You should do the same after you watch those scenes. You'll find a change of clothes in the guest bedroom off the great hall. Then, go to Aranias in the garden." Indrathel: "You're lucky they're alive! How many more ships will you sink?" Aranias: "It was an accident." 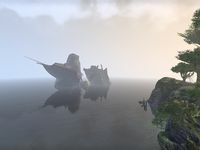 Indrathel: "Accidents are spilling water. Dropping glass. You lifted a ship out of the ocean with a wall of rock!" Aranias: "I didn't mean to. I'm sorry." Lorimil: "Your mother and I will discuss your punishment. Go!" Indrathel: "Your father and I leave for Summerset in the morning." Aranias: "I won't do it again, I promise. I'll try harder. Don't leave me behind." Indrathel: "Don't grovel. It's unbecoming. Your father and I will return with help to control your temper." Aranias: "How much more can I apologize? I said I'm sorry." Lorimil: "No, Ara. It's just … you need training. What you did to the ship, that scares people." Aranias: "What sort of training, Father?" You need to change clothes and speak to Aranias in the garden. Using the dresser in the western room allows you to change into more formal attire. Once you do so, head to the garden behind the manor. "You look good. How do you feel?" I'm curious. How do you control the land? "You asked me this before, silly. I don't know, but when I think about changing things around me, my thoughts come true. Remember when that merchant ship sank? I'd lifted the ground out of the ocean. I just forgot to lower it again." Well, at least there's a party for you now. It's a good sign. "There are so many people. And look, it's High Kinlady Estre! Why's she here? I bet my parents want me to show off my powers. I thought they were bringing me a teacher or something." "Hesitant? I hate this! And they've got something particular they want to see. Would you do me a favor and find out? Mingle among them. Eavesdrop. Find out what they've planned for me." And when you know what's planned …? "I'm not sure yet. They'll probably want another statue raised from the ground. My parents treat that like a party trick, and this is a party after all. But the way they're talking, it sounds more dangerous and I'm a bit worried, to be honest." "Why are we bothering with this girl and her clods of dirt? Andur could melt them with hardly a thought." "What do they call her? The Rock Witch? Hilarious. Provincial." "Her demonstration will determine how we employ her talents." "I'm afraid this one is about to die. I didn't realize how frail Bosmer were." Wait. Aranias is supposed to demonstrate her power on a Bosmer? "Not this Goblin-faced meat-eater, his wife. Wait a minute. You're not with the Heritance!" No, but I've killed quite a few of them. You're right. I stand with Aranias. "They … they took my wife." "They will give her to the witch. The Rock Witch. The land will kill her. They said the land …." Not if I can stop them. "Hm. You killed Andur? That's not supposed to happen." "Oh, don't worry, it was an entertaining twist, to be sure. But sadly, as real as it may seem, this is just a story. In real life, you were not there to kill Andur." Is he more dangerous in real life? "He has had a considerable time to grow in power. And his temper has not gotten any longer, if you understand me. It seems the Veiled Heritance have sent him after Aranias, to ensure she kills the Wilderking, or dies if she fails." "I met him. He wanted to get into this story, but he wouldn't ask nicely. But there's nothing we can do about that right now. We have a story to finish. Aranias' big moment is about to arrive. You should go to her." "In the garden. She's been commanded to kill the wife of this Bosmer. You should hurry to her. She faced this alone last time." Estre: "This creature is no different than those who burned your farm." Maelin: "Please let us go." Estre: "Aranias. Do you remember how helpless you were when your farm burned?" Aranias will then summon vines to wrap around and trap Maelin, and Estre will voice pleasure: "Good. Good. Now, tear this animal apart." "This is my test. If I can take the life of this girl, it means that I'm willing to make the necessary sacrifices." This is not a necessary sacrifice. This is murder. "What about the Bosmer who attacked my island? What were they? Dominion ambassadors? A peace mission?" Those were bandits. This woman did nothing to you. "If I refuse to kill this Bosmer, then what? I'll be alone again. The 'Rock Witch of Silatar,' a monster for fairy tales." You're not alone. I'm here. "You're here with me now, but what about later? No. No, that's not it. I must trust myself. Believe I can do what's right. I don't need anyone, you or the Veiled Heritance, to guide me." "I am stronger than this. I won't murder an innocent to prove I can, no matter who demands it. The Veiled Heritance won't control my destiny, I will. I can do this. And I shall." She then cries out "No, I won't do it!" and traps the heritants in vines. "You were a fine character. Most enjoyable. And it looks like you made quite an impression on Aranias." What just happened? Where did she go? "As one story ends, another reaches its climax. Our little bit of mischief was a success: because of you, Aranias may very well betray her masters to defend the Wilderking." I should listen to Maruin's story so I can enter it and influence her. I've been sent into Aranias' past, when she lived with her parents on an island near Summerset. Maruin told me to talk with her and become her friend. Aranias welcomed me as a long-lost friend. She wants to relive a childhood she never had before her parents return from Summerset. I need to race Aranias to the lighthouse across the island. Bramble vines grabbed my legs to slow me down, and Aranias easily won the race. I should ask her whether she had anything to do with the vines. I should help Aranias kill the bandits attacking her island. After we killed a bandit within the burnt farmhouse, Aranias seemed more agitated. I should talk to her to make sure she's all right. Aranias lost her temper with me, but just as quickly became contrite. She told me to meet her at the manor house, but Maruin's appeared within the story. I should talk with him first. Maruin [sic] will show me another piece of Aranias' past. I should watch it and learn what I can about her from its story. Although Aranias was proud of her ability to sculpt the ground, her parents were less pleased. I should talk to Maruin about this story's significance. The Veiled Heritance of Aranias' past will use her insecurity to bring her into their fold. Maruin instructed me to view other scenes of Aranias's [sic] story to give me a better picture of her fall. The next story is at the top of the lighthouse. I need to find the story in the manor's great hall. I've changed into fancy clothing to attend the reception for Aranias' parents. Aranias is waiting for me in the garden, where the party will occur. The Veiled Heritance plans to test Aranias, but she's not sure what form it will take. I should eavesdrop on Veiled Heritance party-goers to learn what feat Aranias is expected to perform. Several conversations mentioned Andur as a rival with Aranias for a place in the Veiled Heritance. Andur's currently outside the manor grounds. I should find him and talk to him. Andur, standing over a cowering Bosmer, attacked me. I need to defeat him so his plan cannot go forward. With Andur dead, I should free his captive and find out where the Veiled Heritance have taken his wife. Aranias will soon be demonstrating her power for the Veiled Heritance. I need to reach her before her demonstration can occur. The vision of the past has ended and I am returned to the Spinner's Cottage. I should speak to Maruin. This page was last modified on 24 March 2019, at 01:34.